Blackberry, which was the pioneer in mobile-based technologies with its best selling original Smartphones, has been in the news for all the wrong reasons. First, the company known as Research in Motion (RIM), which made and marketed the Blackberries, missed the emerging Smartphone revolution though it was one of the pioneers of mobile computing. Next, the company was unable to read the market and hence, it lost market share to Apple and Samsung. This resulted in the company nearly going bankrupt and despite changes in leadership; it could never regain its position. In the past month, the company has been in the news again because it rejected a buyout offer and rescinded a sale option and instead, chose to appoint a new CEO along with accepting fresh infusion of capital into the company. 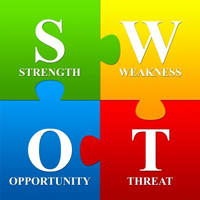 This article discusses the changing strategies of Blackberry through a SWOT Analysis, which would provide clues into how the company would position itself in the future. The key theme here is that Blackberry needs to urgently revamp and rejuvenate itself if it has to regain market share and forget about market leadership, it has to ensure that it stays afloat. Perhaps the biggest strength of Blackberry is that it enjoys top of the mind recall and has a good reputation among corporate users of mobiles because of its proprietary technology that scores over its competitors especially where corporate users are concerned. The Blackberry devices can be used with any mobile carriers anywhere in the world and indeed, this is a key strength for the company as it goes along its business with easy mobility and portability. One of the main strengths of Blackberry is that its devices are more secure than its competitors and indeed, the security features inherent and embedded in the devices are unmatched by any other mobile maker including Samsung and Apple. This is the reason why Blackberries are so popular with corporate users who use it to link it and integrate it with their VPNs or Virtual Private Networks. These strengths have made Blackberry the Smartphone of choice for many governmental agencies in the United States including the FBI, CIA, The White House, and the State Department. Given the fact that Blackberries come with an encrypted military grade security platform makes it the ideal phone of choice for agencies dealing with sensitive information. The key weakness that Blackberry has is that it went on a single-track focus on the corporate users and enhanced its security features as a USP or a Unique Selling Proposition. While this aspect held it in good stead as far as the corporate clients are concerned, once Samsung and Apple came out with Smartphones for the consumers and the everyday usage, Blackberry was unable to keep up with the competition. Indeed, both Samsung and Apple have cornered the market share by enhancing the security features in their Smartphones. Given the fact that small business owners using Blackberries now had to install expensive enterprise software, they began to switch to the rivals instead of using Blackberries. Further, the company lost ground as the proprietary operating system used by Samsung and Apple provided more benefits to this customer segment leaving Blackberry out of the race. As mentioned earlier, Blackberry was essentially a single pony trick with its obsessive focus on the corporate users. With the large consumer base untouched by it, Samsung and Apple quickly garnered this segment and by providing an easy to use user interface and apps that were simple and effective, these companies soon began to take away even the corporate customers of Blackberry. The recent moves by the company are very aggressive as it has rejected a sale offer and a buyout offer as well as accepted fresh infusion of capital from an Angel Investor. By appointing a new CEO and revamping its organizational team and structure, Blackberry has signaled that it is serious and is going all out to reinvent itself. The company has a lucrative opportunity as far as leveraging its existing customer base of over 100 Million users is concerned. Given the fact that the company can tap into this customer base for its future products, there is a significant opportunity waiting for the company. By integrating the third party apps and features into its phones, the company can mimic the strategies followed by Apple and Samsung and the increase in the business partnerships with third party providers can prove to be a key opportunity for the company as it prepares to take on Samsung and Apple. Though Blackberries were the original Smartphones, both Apple and Samsung beat it to the race to build the Smartphone of the future because they provided the flexibility and ease of use that Blackberries lacked and hence, were able to corner market share and take away its competitors. Apart from the threats posed by its competitors, Blackberry has to fight the slack and the gloomy internal environment, which because of the troubles that the company has been through in recent years has resulted in lower employee morale and a general lack of direction. Given the fact that the Smartphone industry thrives on innovation, Blackberry has to rejuvenate itself and reinvent itself apart from rescuing itself from the sagging momentum and motivation of its employees. the preceding discussion has highlighted the need for Blackberry and its management to take proactive steps to pull the company from the quagmire it finds itself in. The recent strategic moves made by the new leadership are to be seen in the light of the companys drift away from its profit making and market leadership model to a situation where it is no longer in the reckoning. In conclusion, Blackberry and its leadership have their task cut out as they gear themselves to take on the challenges from the Smartphone companies like Apple and Samsung.